A “monolithic” architecture uses a single, one-size-fits-all application, which contains both the front-end Angular code, and the back-end Spring Boot code. A “microservices” architecture splits the front-end and the back-end, so that it’s easier for your application to scale and survive infrastructure issues. A “monolithic” application is much easier to work on, so if you don’t have any specific requirements, this is the option we recommend, and our default option. A gateway is a JHipster-generated application (using application type microservice gateway when you generate it) that handles Web traffic, and serves an Angular application. There can be several different gateways, if you want to follow the Backends for Frontends pattern, but that’s not mandatory. Traefik is a modern HTTP reverse proxy and load balancer that can work with a gateway. The JHipster Registry is a runtime application on which all applications registers and get their configuration from. It also provides runtime monitoring dashboards. Consul is a service discovery service, as well as a key/value store. It can be used as an alternative to the JHipster Registry. JHipster UAA is a JHipster-based User Authentication and Authorization system, which uses the OAuth2 protocol. The JHipster Console is a monitoring & alerting console, based on the ELK stack. 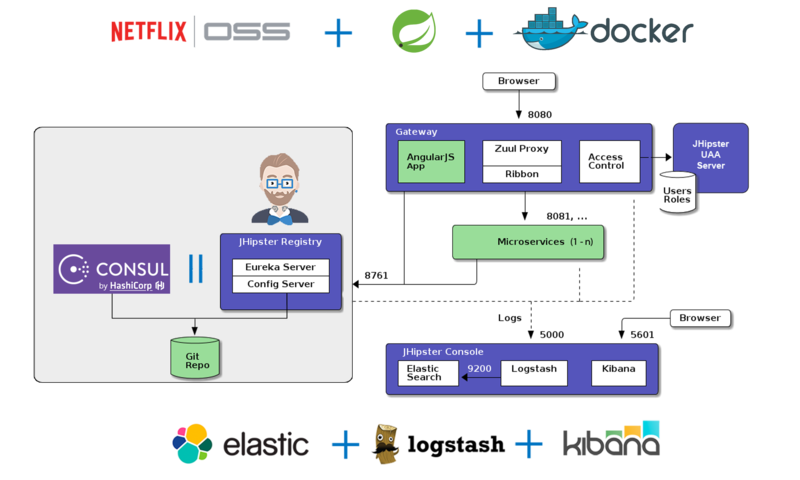 In the diagram below, the green components are specific to your application and the blue components provide its underlying infrastructure.